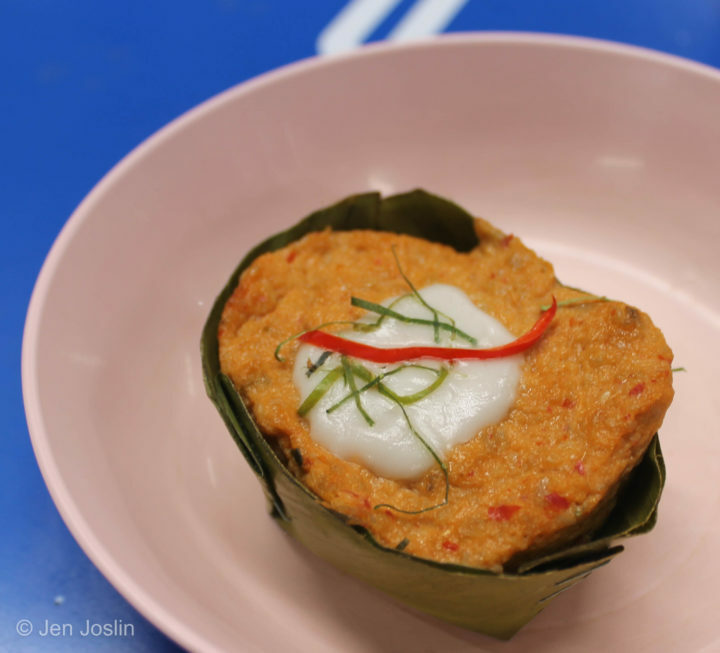 For this series, we decided to cover a specific Thai dish that doesn’t get enough love: Hor Mok! You’ve probably seen these neatly wrapped food parcels at local food courts and Thai restaurants around Bangkok. Hor Mok Pla (fish) is the Thai version of a Cambodian dish called Amok Trei (fish). Both ‘mok’ and ‘amok’ refer to the process of steaming in banana leaves. Hor Mok is traditionally made from freshwater fish, coconut milk, egg, and an herb and spice paste similar to red curry. The mixture is placed inside a cup made of banana leaves and steamed. The result is a fish mousse with a delicate but firm texture and rich, fresh flavors. 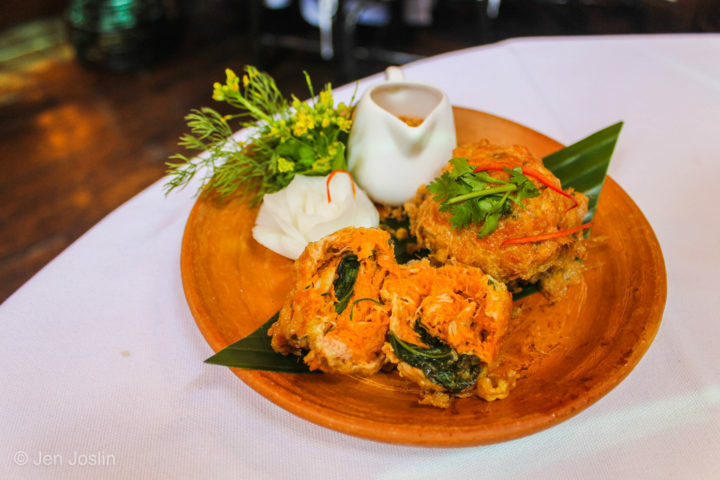 It is topped with thickened coconut milk and garnished with julienned red chili and thinly sliced kaffir lime leaves. In my exploration of Hor Mok in Bangkok I ventured all around the city from local food courts to 5-star restaurants. To start off, my friend Vincent Vichit-Vadakan, an expert in all things food and Bangkok, led me to the Ruam Sab Market food court. There we found a traditional preparation of Hor Mok. The flavors were sweet and salty with a hint of spicy, well balanced but not too strong. 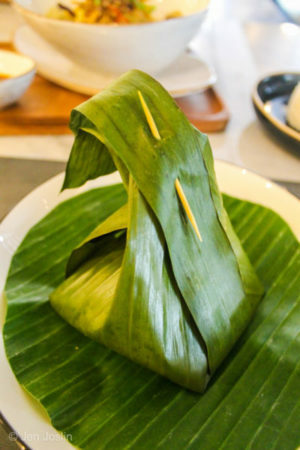 The chopped, slightly bitter bai yor leaves at the bottom of the banana leaf cup were wilted but provided a complementary texture and flavor with the tender fish mousse. Some chefs prepare Hor Mok with chopped cabbage or basil leaves at the base instead. 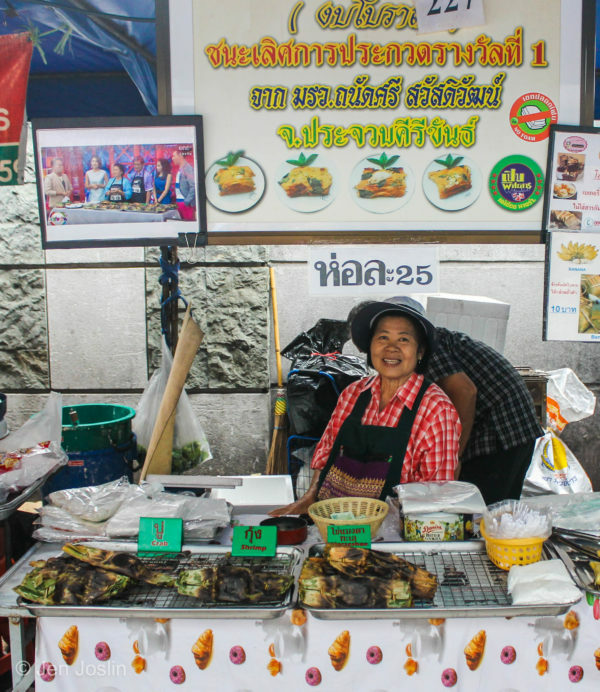 Next, we made our way to the outdoor market at Srinakharinwirot University, open on Tuesdays and Thursdays, to try a grilled version of Hor Mok. The vendor there has several accolades hanging inside her stall, including a photo of her on a TV cooking show. Her versions of Hor Mok were certainly praiseworthy, with a crab, shrimp, and horseshoe crab egg options substituted for fish. Instead of steaming the Hor Mok, she folds the ingredients in banana leaves and secures the ends with toothpicks, then grills them over a charcoal fire. I tried the crab version. The aromas and flavors of the herbs and spices still came through and I enjoyed the flaky pieces of crab meat, smoky roasted taste, and slightly drier consistency. After sampling Hor Mok in these local markets, it was time to step up my game. 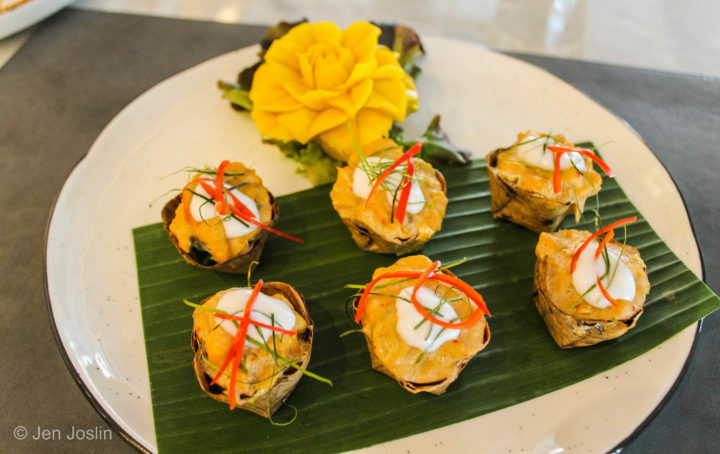 At Blue Elephant, Executive Chef Nooror makes a version of Hor Mok that is served as a starter using prawns and crab meat. She mixes and steams the Hor Mok in the traditional way, with fresh basil mixed in instead of at the bottom. Once steamed, she shapes the Hor Mok into balls, dips them in an egg batter, then deep fries them. The dish is served on a bed of crunchy deep fried egg pieces with a side of sweet chili sauce, vinegar, and crushed peanuts. It is garnished with dill and edible flowers from the Royal Project Farms. Executive Chef Tanoo Chompoosri from the Akara Hotel has another unique take on the dish. He makes grilled Hor Mok with squid, crab and freshwater fish. 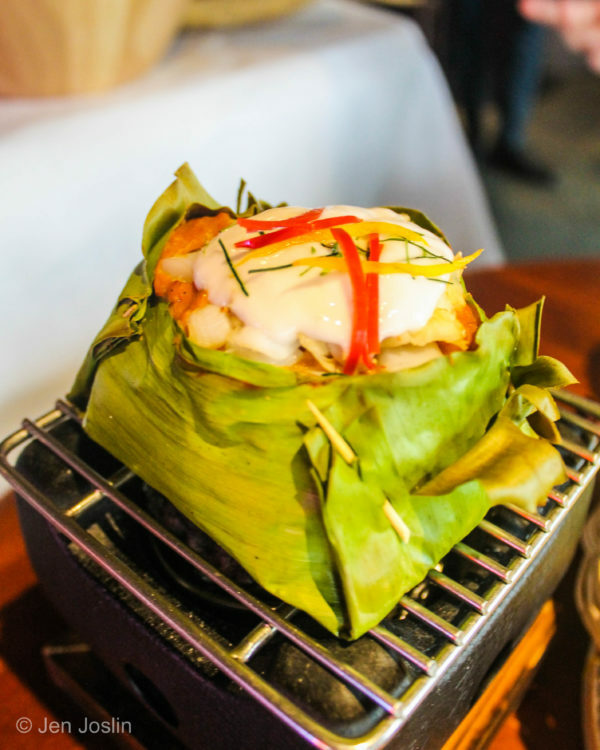 Although grilled versions of Hor Mok like the one at Srinakharinwirot University market are usually enclosed inside banana leaves, his is served open for a more appealing presentation. He creates a larger cup out of banana leaves and secures it with toothpicks. Instead of steaming it, the Hor Mok is grilled then baked in the kitchen. It is brought to the table on a small charcoal grill to continue cooking, imparting smoky flavor as you eat. 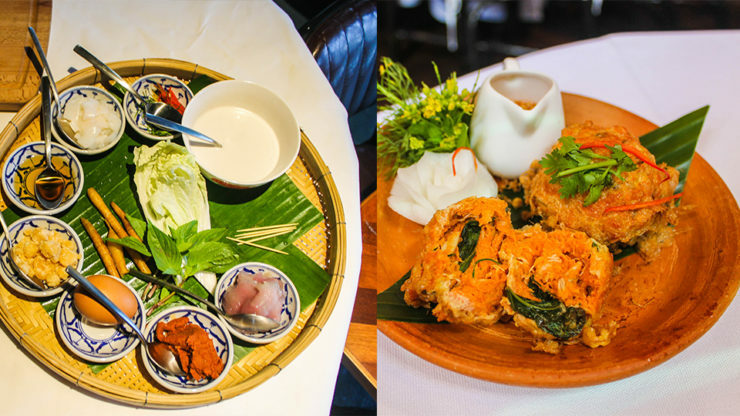 While many Chefs at high-end restaurants like to create twists on the standards, Executive Chef Sutthaporn at the Akyra TAS Sukhumvit Bangkok has a more traditional approach. She learned her Hor Mok recipe from her mom. 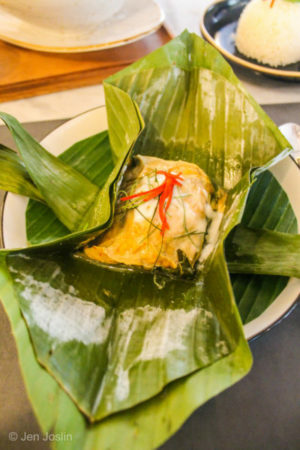 Chef Sutthaporn’s version of Hor Mok used chunks of freshwater fish and minced fish steamed inside of a closed banana leaf parcel. The closed banana leaves held in all the fish oils and spices, so the Hor Mok was moist and juicy. In each bite, the flavors of the spices and herbs came through. Chef Sutthaporn had ground them herself by hand in the traditional way. The bai yor leaves at the bottom provided a fresh taste, slightly bitter on their own but a nice addition when combined with the fish. Julienned pieces of kaffir lime and red chilis on top gave good pops of flavor, and the thickened coconut milk added a creamy element. Chef Sutthaporn also serves tiny cups of Hor Mok as hors devours for parties, which she had me try as well. They were well-balanced bites of the larger version. By the end of my Hor Mok tasting adventures, I was left with the impression that Hor Mok is a greatly underappreciated dish, and that no two versions are exactly alike. The care, techniques, and ingredients that Chefs use to create each style of Hor Mok, from traditional to grilled and even deep fried were delicious in their own ways. 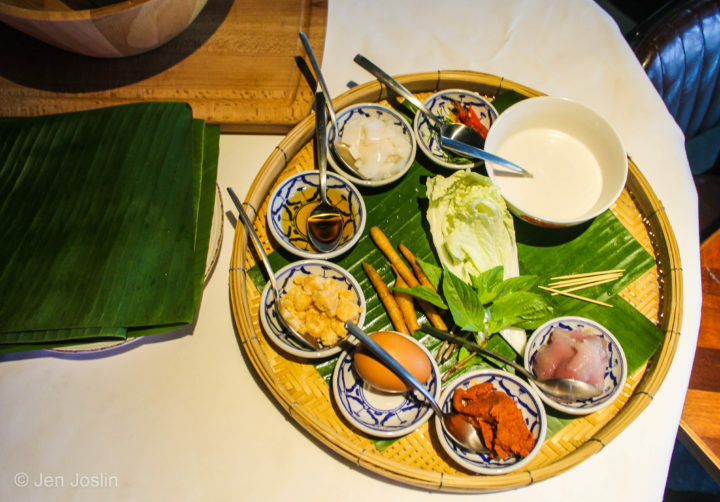 Even within different regions of Thailand, there are variations on Hor Mok, and I encourage you to look for them when you venture outside of Bangkok. 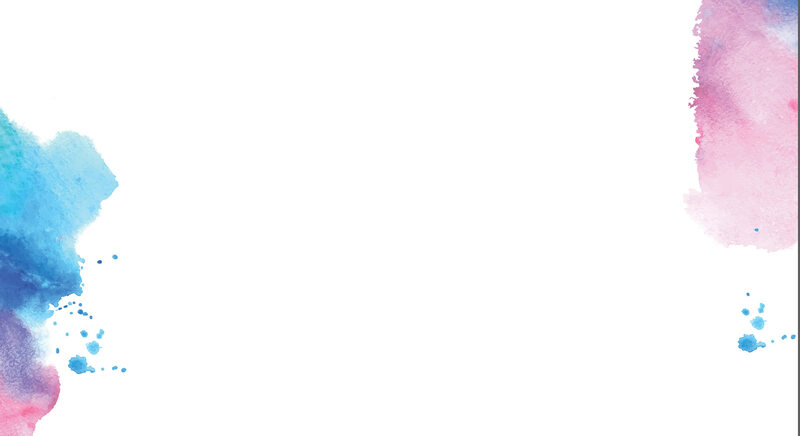 If you want to try Hor Mok for yourself, here are the places from in the article in the order they were mentioned. 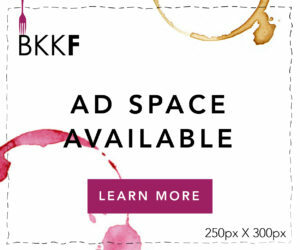 Jen Joslin is a writer, photographer, and social media marketing manager. 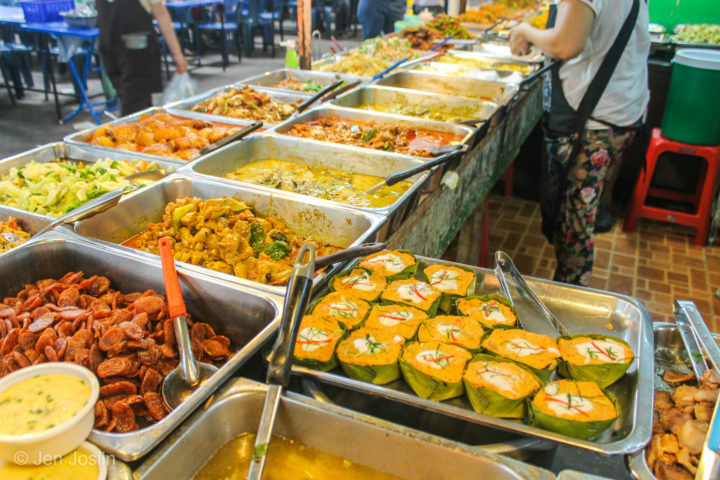 Her current passion is exploring Bangkok’s food scene. 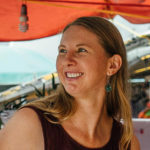 You can find more of her work on her blog www.twocantravel.com and Instagram @Two_Can_Travel where she shares about Asia travels and expat life. I was just wondering if you could make Hor Mok in a big casserole in an oven. I’m trying to serve it in a party but not in individual ramekins.